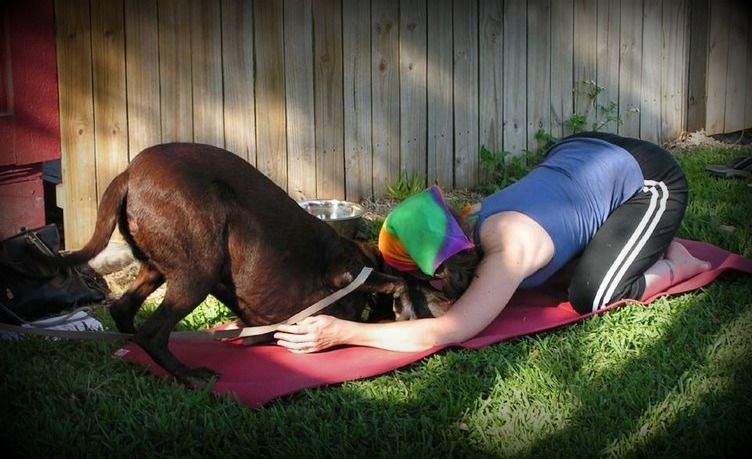 ok, so not really a handstand, but downward dog, with a downward dog. so cute. so I had lots of room to move about. Now, needless to say, I am not the most stretchy first thing in the morning, but some easy movements in a nice warm room really helped my body get moving. – Priscilla, props to her! has been so helpful and instrumental in my finally getting into handstand, if even for a few seconds. As a kid, I always thought it was about throwing my legs up in the air and hoping they stayed balanced. But NOOOOO, I need to ground into my shoulders, really engage into my core, and think of my legs as light (which, I know, doesn’t seem to make a lot of sense), but it has really worked! I can actually hold a handstand for a few seconds! WOOT! WOOT! And I did it again this morning! It is such an awesome feeling to finally be able to do this pose, I’m so excited I’m like a little kid! If you’d like to try it, yoga journal has a slideshow of how to get into handstand. Being upside down can be scary for some people, so try it against a wall, on a padded surface, and don’t overdo it. Just practice and have fun. Enjoy your day off today, whatever you do.